Karrikins are potent germination stimulants generated by the combustion of plant matter. 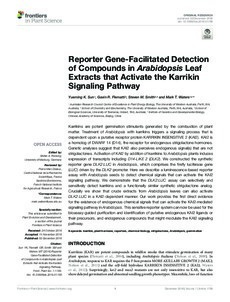 Treatment of Arabidopsis with karrikins triggers a signaling process that is dependent upon a putative receptor protein KARRIKIN INSENSITIVE 2 (KAI2). KAI2 is a homolog of DWARF 14 (D14), the receptor for endogenous strigolactone hormones. Genetic analyses suggest that KAI2 also perceives endogenous signal(s) that are not strigolactones. Activation of KAI2 by addition of karrikins to Arabidopsis plants induces expression of transcripts including D14-LIKE 2 (DLK2). We constructed the synthetic reporter gene DLK2:LUC in Arabidopsis, which comprises the firefly luciferase gene (LUC) driven by the DLK2 promoter. Here we describe a luminescence-based reporter assay with Arabidopsis seeds to detect chemical signals that can activate the KAI2 signaling pathway. We demonstrate that the DLK2:LUC assay can selectively and sensitively detect karrikins and a functionally similar synthetic strigolactone analog. Crucially we show that crude extracts from Arabidopsis leaves can also activate DLK2:LUC in a KAI2-dependent manner. Our work provides the first direct evidence for the existence of endogenous chemical signals that can activate the KAI2-mediated signaling pathway in Arabidopsis. This sensitive reporter system can now be used for the bioassay-guided purification and identification of putative endogenous KAI2 ligands or their precursors, and endogenous compounds that might modulate the KAI2 signaling pathway.